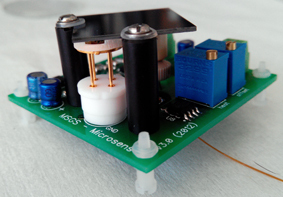 MICROSENS is currently developing a Miniature Gas Analysis System based on a simplified gas chromatography set-up. The heart of the system is the MSGS3000i gas sensor with its driver circuit combined with a Si-microcolumn. A pneumatic circuit and a control interface complete the system packaged in a small portable housing. A small sample volume is injected into the air being pumped through the silicon microcolumn. The gaseous compounds of the sample are separeted through interaction with the lining of the channel walls and arrive thus separately at the MSGS 3000i sensor positioned at the exit of the microcolumn. The resulting chromatogram allows to characterize de sample and detect specific compounds.